The nonprofits and social enterprises I’ve studied thus far are remarkably similar in their relationships to people, which is very interesting to me because experiential aims to improve the depth of trust and relationship between organizations and their stakeholders. Service beneficiaries directly benefit from the nonprofit’s services while not paying for them. Donors fund the nonprofit because they want to support its mission. They may or may not use its services. In commercial firms, users (of a product/service) and payers are usually the same person. Volunteers support the nonprofit’s mission with their time in lieu of money. Partners support the nonprofit by recommending its services to beneficiaries and referring donors or volunteers. They often serve the same beneficiaries in different ways. They are often nonprofits or government agencies. “Members” are not really a separate role but a marketing label for donors who often get the privilege of using the nonprofit’s services for free or at reduced cost. They are most similar to commercial customers. Most nonprofits have adopted commercial firms’ “best practices” for social media, and their business results are poor to nonexistent (commercial firms rarely see a business return either). They use social media to share content with their followers/friends. The first step in breaking through to stakeholders is to change your orientation toward them. Like commercial firms, nonprofits’ stakeholders have outcomes and personal motivations for supporting the nonprofit; they don’t support it as an end in itself. For example, volunteers often have social reasons for getting involved; they want to meet people socially while supporting a cause. Such volunteers will respond to you far more when you engage them around their social motivations (as well as altruistic motives). Second, significantly increase the portion of interactivity in your social media activity. People pay much more attention to you when you interact with “someone like me” and empower their outcomes, and this can be very scalable. For example, instead of just showing happy pictures of volunteers, share stories about the great social connections they are making (of your research shows that this is an outcome). Ask them to share their stories; they are more credible than you to potential volunteers. Nonprofits have a moral barrier that commercial firms do not. Volunteers and donors often want to be recognized for their support of the cause and may not admit their true motivations, but you can still relate to them around those motivations, and they will more responsive when you do. Here are some guidelines for each stakeholder type. By the way, “digital public” refers to third party social media sites, not your accounts. As businesspeople say, “Go to where the customer is”; it’s easier to connect where she’s already talking with people like her about her outcomes than trying to get her to interact on your accounts. Beneficiaries, although they often don’t pay for services, need education and motivation for using your services. They may not know about you or the impact your services can have on their lives. Remember, even they rarely want to use your services, but they have outcomes for which they are willing to use them. Current beneficiaries will often know others who could also benefit, and my research consistently reveals that, when referring, they usually focus on outcomes more than on the services themselves. Potential donors are in digital public discussing the social ills they care about, so entering these interactions and sharing your insights about lessening those ills will attract attention. Do this without suggesting your organization or services but clearly identify your affiliation. Talk about ways to have impact on the social ill under discussion. Volunteers are in digital public discussing their outcomes that could be fulfilled by volunteering, so making suggestions attracts attention, again, without suggesting that they volunteer for you. When you inspire them (and the crowd of other people like them who are observing the interaction), they will seek you out, using the link you provide (most platforms enable you to disclose your affiliation and include a URL). When you interact with stakeholders while focusing on their outcomes, you can use your stakeholder insights to inform your content strategy (in every engagement with global brands and even an NGO and a government, they gained many insights beyond their traditional research). Adjust your content to address outcomes. Stakeholder interactions in digital public will usually center on outcomes, so catalog, bookmark and share links to them in relevant interactions in digital public. They are more convincing that any content, and, as curator, you build admiration and trust. Outcomes are “customer language” so shifting your orientation to outcomes usually improves engagement. Do not focus on your organization and services but clearly disclose your affiliation and provide a URL that shares a landing page that’s oriented to outcomes and points to your website’s conversion pages (donate/volunteer/become-a-member buttons). While researching the Chicago Social Empowerment, I also discovered that experiential social media seems to have an innate affinity to nonprofits, and I’m terrifically excited about this discovery! Ethos: Experiential’s core action is empowering people’s outcomes in digital public, so its ethos resonates with nonprofits’ and social good groups’ since their missions are grounded in helping and supporting people. Empathy: Ethnographic research of social media is experiential’s research approach. It enables experiential teams to get insight into stakeholders’ outcomes based on hundreds or thousands of specific social interactions, so we develop true empathy with stakeholders. Empathy enables us to interact distinctively with stakeholders to help them reach their outcomes. Business action: most nonprofits and social impact groups have donate, volunteer, and become-a-member buttons on their websites, so revenue models and operations are often similar: in a way, nonprofits resemble ecommerce businesses, so experiential’s high engagement can lead directly to measurable revenue. Marketing suppressed: although nonprofits have adopted many practices from commercial firms, they are naturally less salesy than commercial brands. One of experiential’s key differentiators is that practitioners don’t promote the organization or its services; instead they empower people who correlate highly with the organization’s services. Metaphorically, I think experiential social media is “the nonprofit way to do social media” because its main function is helping, supporting, empowering, caring. It doesn’t talk about caring, it demonstrates it, right in digital public! I have learned that being more “selfless” (i.e. little marketing and self-promotion) is the express lane to building relationship and trust, and I’ve seen this among nonprofit, government and commercial clients; that said, since nonprofits’ business models are often simple and direct, and their ethos naturally resonates with experiential’s, I hypothesize that experiential will be especially empowering for them. We will all see whether the facts bear out this hypothesis. Chicago Social Empowerment will provide significant data on our results. Experiential social media home page includes the briefest text I’ve yet managed as well as a brief introductory video and a case study with very detailed and executive summary versions. 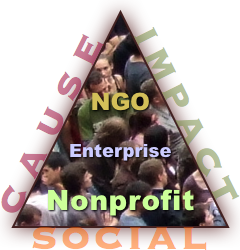 I’ve been thinking about this for quite a while: see How Nonprofits & NGOs Can Press Their Home Court Advantage in Social Business. How to use stakeholder and workstream analysis to increase social media engagement: Ethnographic Research of Social Media for Social Media. Rollyson.net’s Technique tag features how-to posts that go back a decade.